You are a wizard. You have a favourite colour. You don't like wizards who like other colours. Especially those wizards in the other tower. 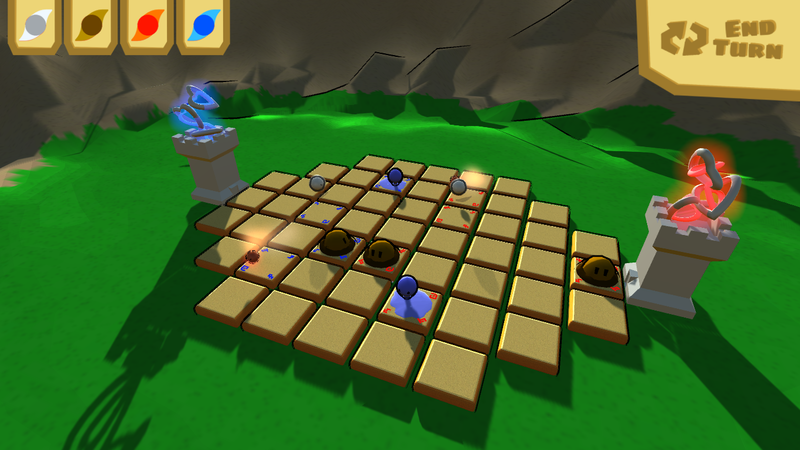 Send in your elemental minions to out manoeuvre your foe's and bring their tower to the ground! Don't attack minions that your minion is weak against (eg Earth attacks Water); it will die. Attacking an enemy of the same type will stun it for the next turn. Attacking an enemy of the opposite form (eg Water and Fire) will cause both to be annihilated. Every few turns you will gain the opportunity to spawn a new unit at your spawn point, the tile in front of your tower. To win, reduce the enemy's hitpoints to zero. You lose a hitpoint for every turn you end with an enemy in your spawn.